Delhi is not just a cultural hub; it is also the home to many temples. There are a number of beautiful temples in the capital, which are architecturally beautiful and breathtaking. The temple dedicated to Goddess Katyayani Is located in South Delhi. It is India’s second largest temple complex. The temple complex is entirely made of marble and is built by vesara style. There is a side shrine in the main temple for Goddess Katyayani (Durga) and its door opens only during the Navratri Season. People flow in numbers to take the blessing of the goddess during this season. The temple not only sees visitors who are Hindus, but also of other religions too. It is a huge, lotus shaped prayer hall where people of all religions can pray and meditate in peace the building is just like a lotus and is made of pure white marble. The lotus temple is a very popular site in the capital city. There are more than 10,000 visitors every day. The temple is surrounded by a manicured garden. It is also a perfect picnic spot. 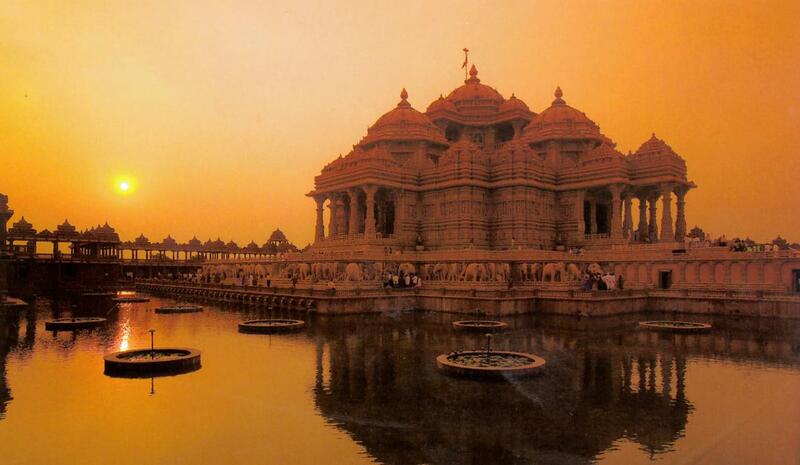 Swaminarayan Akshardham Is the largest Hindu Temple in the country. It is in fact mentioned in the Guinness world records. The premise does not just consist of temple but also Sahajanand Darshan, musical fountain, theatre, boat ride and garden of India. The 15 minute boat ride is a treat for the visitors. The musical fountain takes place inside India’s largest step well. The show is very colourful and mesmerising. It is said to represent the circle of life. The Sri Sri Radha Parthasarathi Mandir, is the most famous among all the Vaishnava temples dedicated to Lord Krishna and Radharani. It is also a centre where students learn Veda. It is located at the East of Kailash, Delhi. The temple is vast and has a beautiful architecture. There is space for several activities, training, seminars, cultural programs and festivals. If you visit the temple on a Hindu festival, the entire premises will be lit up with lights and will be decorated with flowers. There will be sounds of chanting, ringing bells, and devotional music. Birla Mandir Is located on the west of Connaught place. It is a temple dedicated to the Lord Lakshmi Narayan.You can also see many small shrines of lord shiva, hanuman, lord Ganesh, and Buddha. The temple will be at its best appearance during the festivals of Diwali and Janmashtami. The temple building consists of carvings inspired by the Hindu mythology. The gurudwara is a sacred place for the Sikhs. It is located near Connaught place. Here you can find langar, a practice where people from all races or religion will get food to eat. The food is prepared in the gurdwara kitchen itself. Every day, volunteers help to prepare and serve the food. These are some of the sacred places that you can visit in Delhi.